Komen, why’d ya have to lie to me? thanks, Katie @ Uneasy Pink for the laugh! Oh, Komen. Komen, Komen, Komen. Why’d you have to lie? There might have been a chance — a teensy, weensy chance — that you could have come out of this firestorm with a speck of dignity and integrity left, but you blew it. Big time. Well, the good thing about Komen’s decision to kick Planned Parenthood to the curb — and to bold-faced lie about the reasons behind that decision — is that we bloggers will have fodder for days. Thanks, Komen. Thanks for being sneaky and deceitful and for showing your true colors. If I weren’t so sad by the fracas and the potential to help so many that has been so foolishly pissed away, I might be grateful. But I’m not grateful. Even though it’s nice to have a definitive answer on this organization’s true motive, and it’s nice to know for sure that Komen is not what it claims to be, I’m not grateful. I’m mad. And anyone who knows me will tell you that once I get mad, I stay mad. For a long time. As I mentioned in yesterday’s post, I sure wish Komen would have just been honest about its motivations to drop PP in the grease. The fact that Komen continues to hide behind the travesty of an ongoing “investigation” instead of coming clean about its reason for breaking with PP sickens me. Komen founder and chief executive Nancy Brinker continued the lie in a news conference yesterday, saying that SGK’s decision to pull its funds from PP has nothing to do with politics or abortion. Raise your hand if you believe one word that comes out of this woman’s mouth. Here’s the thing — I don’t care if Komen wants to pull its funds from PP. I disagree with the wisdom of that decision, but Komen certainly has the right to do what it wants with its money. But don’t lie to me. Maybe Brinker thinks the general public is too dumb to see right through this. Sorry, Brinker, but I’m not stalled by your rhetoric, by your multi-syllabic alliteration. Guess what, Nancy Brinker: you didn’t need to worry one bit about Stearns’s trumped-up, bogus witch-hunt of an “investigation” damaging Komen’s credibility with donors. YOU DID THAT ALL BY YOURSELF. Really, wouldn’t it have been easier to come clean? To be honest? To tell the truth, which is that Brinker and SGK no longer wanted a business relationship with PP because of a difference in political views? To that end, can someone please explain to me how not one word has been uttered by SGK about its 5-year, $7.5 million research grant to Penn State’s Milton S. Hershey Medical Center? Last I heard, the sexual-assault scandal at Penn State involving Scumbag of the Year Jerry Sandusky involved a federal investigation of the university. How can 40 counts of sexual abuse over a 15-year period be ok, while a mere 3 percent of PP’s services being dedicated to terminating unwanted pregnancy is worthy of an epic break-up? The hypocrisy is staggering. The local Planned Parenthood president and CEO Peter Durkin had something to say about the decision, too: “As a leading health care provider in our community, Planned Parenthood is trusted to help women identify breast cancer early. We are deeply alarmed that the Susan G. Komen for the Cure Foundation appears to have succumbed to political pressure from a vocal minority.” He went on to say that the Gulf Coast Planned Parenthood was “deeply disappointed” with Komen’s decision. Mollie Williams, SGK’s top health official, resigned from SGK over this. Williams, the director of community health programs for SGK and in charge of deciding how to allocate $93 million in Komen grants to more than 2,000 community-health organizations said, “I have dedicated my career to fighting for the rights of the marginalized and underserved,” she wrote. “And I believe it would be a mistake for any organization to bow to political pressure and compromise its mission.” So the person in charge of handing out Komen’s money–who definitively knows who is worthy of receiving those funds–disagrees strongly enough with the decision to end the relationship with PP. Not just that, she disagrees strongly enough to quit her job. Wow. All 7 of California’s SGK affiliates are “strongly opposed” to the decision, and the top official for SGK California joined Williams in resigning from the organization. Those affiliates are working hard to overturn Komen’s decision. So far, 26 U.S. Senators have called on SGK to reconsider its decision, saying that “it would be tragic if any woman . . . lost access to these potentially lifesaving services because of a politically motivated attack.” I suspect this is only the beginning. 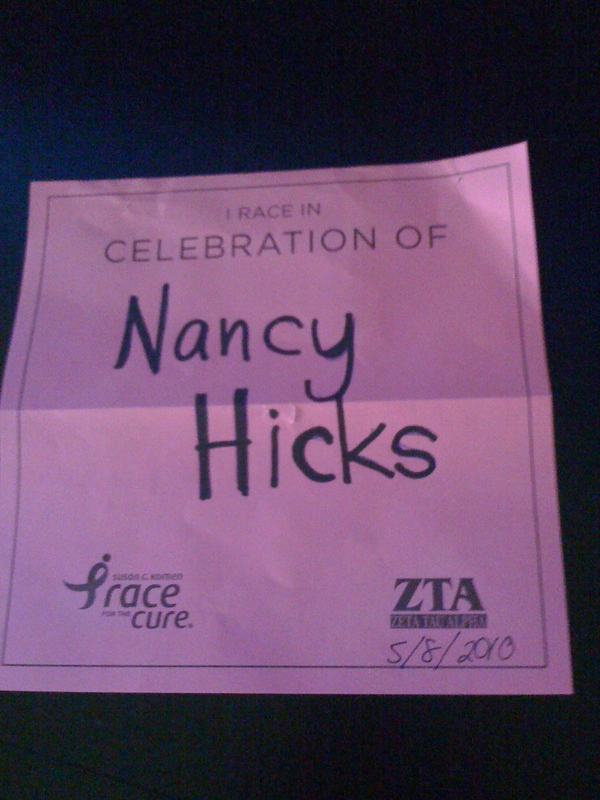 The Race for the Cure, which is SGK’s most iconic fundraiser, is on the endangered species list. The very first Race for the Cure was in 1983 in Dallas with 800 participants. Last year, there were 130 races worldwide with 1.6 million participants, according to Komen’s website. The Philadelphia Inquirer interviewed Kivi Leroux Miller, a North Carolina-based consultant on nonprofit marketing strategies, who said Komen was “naive” to think it could distance itself from the abortion debate while doing the very thing that antiabortion Senate Republicans have been trying to do – defund Planned Parenthood. Naive and egotistical, IMHO. I know one Race for the Cure participant who won’t be forking out $40 to enter Houston’s 2012 race. That makes me sad, because last year’s race was a lot of fun. And if any of my crew plans to participate in an upcoming Race for the Cure (should there be any), don’t bother writing my name on the “In Celebration Of” pink sheet. Thanks but no thanks. I don’t need Komen to help me celebrate my survivorhood. Komen’s decision has taken center stage — in the news, on the Web, in the blog-o-sphere, and in the twitterverse. It was front-page news in my newspaper today, and probably in those of every other major city. The Seattle Times features a great story today about a formerly dedicated Komen fundraiser, Celeste McDonell. A Seattle lawyer and breast cancer survivor, McDonell labels herself as a “longtime, passionate Komen advocate.” She’s raised serious funds for the cause, too, by spearheading a “Row for the Cure” event that in 10 years has raised more than half a million dollars for her local Komen affiliate. Last year alone she raised $84,000 in her event. McDonell’s law firm had just committed to sponsor the next “Row” fundraiser, but has put that on hold, she said. Instead, a commitment has been made to Planned Parenthood. “Our firm is a strong believer in social justice and thought this was a move that needed to be made,” McDonell said. McDonell’s story is but one in a crowded field of former supporters who are now protesting Komen’s decision. The American Association of University Women has cancelled plans to offer a Komen Race for the Cure as one of the activities at its upcoming National Conference for College Women Student Leaders (NCCWSL). Stating that the AAUW is “disappointed with the Susan G. Komen Foundation’s decision to strip funding for cancer screenings from Planned Parenthood,” the AAUW will not offer the Susan G. Komen Global Race for the Cure as a community service opportunity at its NCCWSL. For 27 years, college women from across the nation have attended the NCCWSL, but this year there will be no Race for the Cure. Oh Komen. Komen, Komen, Komen. You sure stepped in it this time. I can understand the pressure. I can understand being torn. I can understand the desire to do the right thing (yet missing so spectacularly). But I can’t understand the dishonesty. I can’t fathom why SGK didn’t just say that after 5 years of partnership with PP, we’ve decided to go in a different direction. I can’t wrap my head around why Komen had to lie to me. You did it again, my friend. Keep the vitriol going. WWSGKT? What would Susan G. Komen think if she were still alive? Wonder what her sister thinks who founded it? FANTASTIC post. Great job. I hope nobody runs for the cure and everyone donates to Planned Parenthood and I guess the American Cancer Society. Do you have a favorite cancer organization as an alternative to lying, women-hating, condescending, politicized Komen? Nellie, I like Dr Susan Love’s Army of Women bc it is research-oriented. I also like the idea of putting money in the pockets of local BC organizations. In Houston, there’s The Rose, which provides breast-health services to uninsured women. Most cities have something similar. It’s amazing how many lies are out there. My husband lied to me, too. It hurt like crazy. Why didn’t he just tell me at the outset of his “ventures” that he didn’t love me anymore and let me move on with my life? What happened to telling the truth? Lack of courage and fortitude. These things are sorely absent from our society. I am saddened, once again, by my fellow humans. On such personal, private matters why is it not enough for us to decide what is right for ourselves? Why do so many need to also decide what is right or wrong for others? As you said, Nancy, Komen should just say what they are doing and save the justifications. Particularly such weak and transparent ones. In case no one’s heard the news, Komen has flip-flopped and agreed to restore PP funding. I credit the Pink Underbelly for changing their minds. Great job! Komen’s been stepping in it for a long time now, refusing to hear what their critics say. Komen lied to me as well last Fall, when they told me they would right something in their post on my blog to the effect that “they hadn’t always done things right but were working hard to hear voices other than their own.” All they did was justify themselves. I believe they are an insular organization that’s lost sight of the prize. Now that Komen has relented, I hope that all these races and other plans with Komen that were cancelled so quickly will be restored just as quickly. Thanks for putting words to my feelings. I value honesty and hate feeling lied to–and that is what seems to be happening with this whole situation. I understand that issues are complicated and we live in a world full of grays vs.. everything being black and white. But being simple, direct and honest is always the best path! I will be sharing a link to your blog on a website dedicated to honesty; it is called The Honest Course: http://www.honestcourse.com. Since it is not a WordPress colleague, i am not sure you will get notification of my reference. I am sure those readers will value your insight and honesty as much as I do. I hope it’s OK that I posted a link to this on Facebook. As for Komen reversing… Don’t be too sure! They used squirrelly language that was not definitive or forthright – and they defended their cast of characters! Nellie, thanks for mentioning facebook. The last time we redesigned the site I must have left the sharing buttons off, I just added them back in to make it easier to do just that. Are you aware that Duke University is going to give Nancy Brinker an honorary degree (just announced Jan. 23, 2012, right before the defunding of PP was publicly announced by Komen)? Given this fiasco, I don’t see why she deserves one, unless it’s a degree in lying to the public, your donors and supporters. How to start an online petition to Duke University to get them to rescind this honorary degree to a person who CLEARLY does not deserve it? Nancy (H.) and I both shared concerns long before this recent brouhaha about what Komen does with their money, particularly the skimpy funding of research. And though they’ve clearly done women a favor by erasing the shame many women felt about a breast cancer diagnosis, they’ve created new problems by glamorizing and commercializing the disease. 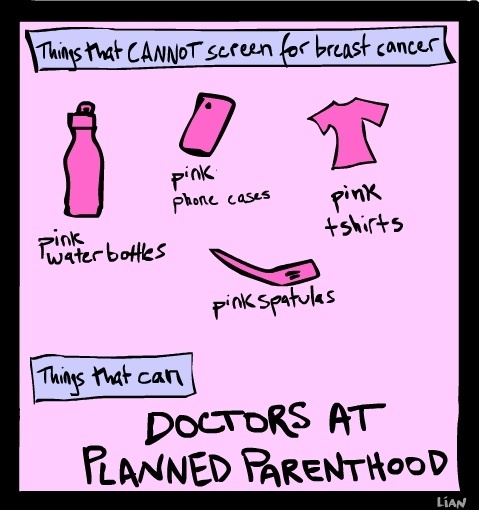 This Planned Parenthood episode is another black mark for Komen in my book. So I was not a big Komen fan or contributor to begin with. But I don’t deny the mountain of good the organization has done despite its flaws. How many women are alive today because of Nancy Brinker’s hard work? I don’t know the answer, but I bet it’s a lot. And that means more to me than some very human flaws she has. Overall, 2012 is a much, much better time to get breast cancer than say, 1982, and we have Ms. Brinker to thank for much of that change. I’m a Duke alumni and though I’m deeply disappointed in the decisions she has made lately; considering her lifetime of achievement, on balance I’m still proud to have Nancy Brinker associated with the university. A few years ago Duke faced a PR challenge, panicked and unjustly threw its lacrosse team under the bus. I hope it doesn’t repeat that with Ms. Brinker. Trevor, thanks for the honest response and your viewpoint, especially in light of the Lacrosse team panic attack. Unfortunately, no matter which way they go, they are stepping into it and it’s unfortunate for them that they didn’t have a crystal ball to view the future, because I doubt that Duke would be awarding her anything this year if they’d known (if for nothing else but to not be associated with the brouhaha). But perhaps you are right. It may be better for Duke U. to continue along and hope that the scandal has dissipated by the time the degree is awarded. While Komen for the Cure has done much for women with breast cancer through it’s DONORS, VOLUNTEERS, SPONSORS (some of whom are pinkwashing) and COMMITTED STAFF PEOPLE, it’s also done much for Nancy Brinker’s personal bottom line. Are you aware that she has spent donor money lobbying congress to NOT fund breast cancer treatment for low income women because she believes that PRIVATE FOUNDATIONS, such as hers, of course, should be providing those services (which they don’t, but nevermind). So, it’s all bottom line for Ms. Nancy Brinker behind the fish lips and updo. They just announced their pink gun today, or yesterday, or whatever. This is a MARKETING organization appealing to people’s compassion and fear and sadness over breast cancer and utilizing them to benefit herself and a few top dogs, more than a cancer research or whatever organization. Took the words right out of my mouth. I won’t be doing their race ever again. Shame on them!